Do We Use the Broil Method or Bake Method to Make a Roast Beef in the Oven? A savory, home-cooked beef roast is one of life's little pleasures, especially when served with mashed potatoes and gravy. However, novice home cooks may find a roast a daunting challenge to prepare. To cook your roast properly, you must first understand the basic differences between cooking methods such as baking and broiling, and which better suits your roast. Baking is a low, slow cooking method where heat radiates from a bottom burner throughout the oven and cooks food indirectly. Baking temperatures for most foods usually range from 300 degrees to 400 Fahrenheit, and rarely go above 450. In broiling, high heat is applied directly to a food's surface at close range from a top burner. Boiling temperatures commonly range between 400 and 450 Fahrenheit. 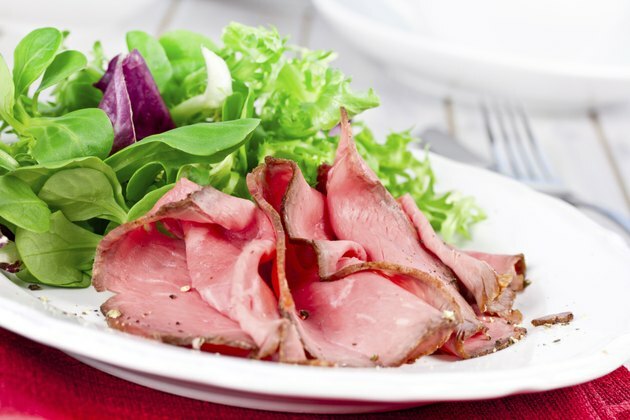 Roasts are very thick cuts of meat with a great deal of fibrous tissue. Broiling a roast -- even at a low temperature -- would cause it to cook very quickly on the top outer surface, while staying nearly raw on the underside and in the center. Roasts require the radiant heat and lower temperatures of baking to slowly and gently break down their connective tissue and make them tender. While no beef roasts require broiling, different roast cuts do require different roasting times and temperatures. Bake leaner roasts, such as sirloin and tenderloin, in no liquid at a higher temperature for a shorter period of time -- about 375 Fahrenheit and 1 1/2 hours for a 4-lb. roast. Bake tougher, fattier roasts such as short loin in a small amount of liquid at a lower temperature for a longer period of time -- about 325 degrees for two or three hours. Technically, this is a braising method, commonly referred to as roasting. For a flavorful beef roast, slit small pockets into the meat before cooking and insert herbs, spices or garlic, or coat your roast with a spice rub. Good options for beef include onion powder, garlic powder or granulated garlic, black pepper, oregano and coarse salt. Cook lean roasts on a baking rack placed into a deep baking pan to avoid burning due to surface contact. When cooking tougher roasts, add beef stock and/ or wine to your roast instead of water for extra flavor, and set your roast on a bed of root vegetables such as potatoes, sweet potatoes and carrots for an instant meal. No matter how you cook your roast, once you remove it from the oven, let it rest for a full 10 to 15 minutes before slicing to prevent the juices from running out.